More than fifty years after Lee Harvey Oswald killed President John F. Kennedy in Dallas, Texas, on November 22, 1963, writers are still trying to make sense out of an assassination which has proven also to be something of a national obsession. In The Interloper: Lee Harvey Oswald Inside the Soviet Union, Peter Savodnik seeks to deepen our understanding of Oswald himself through an exploration of his time in the Soviet Union, where he lived from 1959 to 1962, primarily in the provincial Belarusian city of Minsk at the height of the Cold War. Savodnik’s book is unlikely to have much appeal to conspiracy theorists. Savodnik posits early in the book that Oswald acted alone in killing the president, and that the “lone gun” theory is the only plausible account of the assassination. The question we should be asking, Savodnik contends, is not who killed President Kennedy, but why did Oswald kill him. In many senses, Oswald fit the all-too-familiar pattern of the American assassin, a lonely, disturbed, undistinguished young man whose notorious act – at least for those who accept the lone gunman theory – seems nearly senseless. But Oswald’s time in the Soviet Union during the Cold War sets him apart from other American assassins. Exploration of Oswald’s experiences in a country that was the “arch enemy of his own” (p.27) thus adds a dimension to Oswald’s life which, Savodnik indicates, has not previously been examined in depth. 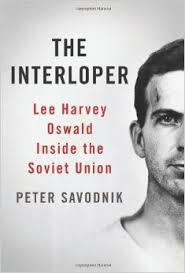 As the word “interloper” in his title indicates, Savodnik’s overriding theme is that Oswald was never at home anywhere. He was always an outsider, an interloper. His failure to settle anywhere made him more aware of his status as an outsider or interloper. “And with this awareness came anger building to a fury” (p.xv). Oswald actually spent more time in Minsk than any other location in his short life and, Savodnik stresses, he came closest in Minsk to shedding his interloper status and achieving a “sense of place” (p.xiv). Savodnik finds a very American quality to Oswald’s rootlessness. Oswald’s “fury, naïveté, narcissism, and even indifference to whatever place he had parachuted into” for Savodnik reflects an “uncontainable rage that felt and sounded American,” expressing a “classically American individuality, a desire to be free of external forces and to achieve a wholly separate self that had not been shaped by other people, clans, or institutions” (p.210). Savodnik’s book is arranged in three general sections, “Before Minsk,” “Minsk,” and “After Minsk” addressing, respectively the first twenty years of Oswald’s life; the 32 months in Minsk, from October 1959 to June 1962; and Oswald’s final 17 months back in the United States after leaving Minsk and the Soviet Union, from June 1962 to November 1963. Oswald’s tortured relationship to the United States is a constant theme throughout the three sections. A final section, “Epilogue: A Conjecture,” seeks to use Oswald and Kennedy’s intertwined lives to explain the United States in the early 1960s. Born in 1939 in New Orleans, Oswald had a tumultuous youth and was adrift from his earliest days. His father, a descendant of Confederate Civil War General Robert E. Lee (the reason for Oswald’s first name) was an insurance premium collector who died of a heart attack in August 1939, two months before his son was born. His father’s death and absence from Oswald’s life “might be regarded as the defining trauma of Oswald’s entire life, setting in motion a youth of chaos and frenzy” (p.3), Savodnik argues. He describes Oswald’s mother Marguerite as “perennially unstable” (p.xiv), “unreliable, frantic, harried, hectoring, needy, and prone to irrational outbursts” (p.4), hardly capable of playing the role of one parent, let alone two. Marguerite and her two sons, Lee and older brother Robert, moved from New Orleans to Dallas to Fort Worth to New York City, then back to New Orleans. In a previous marriage, Marguerite had another son, John Pic, Oswald’s half brother, with whom he had intermittent contact. Marguerite’s “inability to provide any semblance of stability and normalcy for her youngest son” is “clearly reflected in Lee’s constant moving” (p.4). Oswald attended 12 different schools and by one count had resided in 17 different locations before dropping out of high school at age 16. Oswald’s peripatetic and essentially homeless youth “cannot be stressed enough,” Savodnik contends, in understanding the “unstable man Lee Harvey Oswald was to become” (p.4). Savodnik asks his readers to view Oswald’s embrace of Marxism through the lens of Oswald’s childhood and adolescence. There was “little, if anything, in Lee’s childhood that suggested he might one day embrace radical politics” (p.9), Savodnik notes. But by the time Oswald reached early adolescence, there was an “obvious emptiness in his life, a desire for something real and deeply felt to compensate for the home that was sorely missing” (p.9). At age 15, Oswald began to teach himself about Marxist theory. By then, the “gulf separating Oswald from his mother was probably unbridgeable, he had very little extended family to speak of, and he had no friends or place that he thought of as home” (p.9). Marxism offered the young Oswald “discipline and purpose” and was “shot through with a vocabulary and mood that comported with Lee’s mounting rage” (p.9). But here, and throughout his life, what Oswald believed to be strongly-held ideological convictions were nothing more than what Savodnik characterizes as “very personal feelings – about his home, his family, his sense of rootlessness – that had hardened into political viewpoints but, at root, had nothing to do with anything explicitly political” (p.171). After dropping out of high school, Oswald joined the Marines at age 17 in October 1956. He spent nearly three years in the Marines, but left on a hardship discharge at age 20, claiming that his mother needed care. In October 1959, almost immediately after leaving the Marines, Oswald traveled to Moscow on an overnight train from Finland, where he arrived with a one week visa. In his short time in Moscow, he applied for Soviet citizenship. The request was denied and Oswald was told that he had to leave the Soviet Union immediately. There then followed an ostensible suicide attempt. Oswald stayed in Moscow under psychiatric care, until the end of October 1959, when he went to the United States Embassy in Moscow in a failed attempt to renounce his citizenship. Hinting to Soviet authorities that he might have valuable information to pass along based upon his time in the Marines, the Soviets allowed Oswald to stay in the country. The KGB, suspicious that he might be an American “sleeper agent” (p.83), found Oswald “difficult and irascible and, at times, histrionic, self-pitying, and reckless. He could hardly have been counted on to do or finish anything” (p.33). He was sent to Minsk, a city that was “proudly Soviet and conservative” (p.119) and an unusual destination for defecting Americans – most at that time were sent to Ukraine. Although the city of Minsk had existed since the 11th century, Old Minsk had been largely flattened by the Nazis. Even prior to the Nazi invasion, the population of Minsk had been depleted by Stalinist collectivism, mass deportations and the purges of the 1930s, destroying “most everyone who might have helped cultivate a national identity separate from the Soviet super state” (p.72). Consequently, New Minsk was a “model communist city . . . broad, orderly and boring . . . an unequivocal statement of the totalitarian impulse” (p.70). It lacked “its own commercial practices, its own mores and rituals” as well as any deep traditions of “artistic and intellectual inheritance” (p.73). Nothing in Minsk connected its citizens, termed Menchani, with previous generations. Rather, the Menchani were “above all Soviet. They may also have been Belorussian, Polish, or Russian, but their primary identity was their ideology” (p.72). They were thus quite unlike residents of the Baltic states or Ukraine, who had “retained a national heritage and were in a permanent state of semi-war with the Soviet regime” (p.72). In Minsk in the early 1960s, World War II continued to be the overriding force that shaped the mindset of all adults. The experience of the war had been “so intense, so acrid, bitter, and all-consuming, that it had changed everyone permanently. It was hard to understand people who had not been changed in the same way” (p.81). Not having lived through that war experience, “Oswald could never really grasp the shape and scope of the lives of everyone he spent most of his time with – and it meant that they had a very difficult time making sense of Oswald” (p.76). Under Stalin, who had died six years earlier, in 1953, “any right-thinking Soviet citizen would have avoided Oswald, an American, for fear of being branded a traitor or counterrevolutionary” (p.54). But by the time Oswald arrived in Minsk in 1959, Communist Party First Secretary Nikita Khrushchev had not only denounced Stalinist crimes but was also seeking to loosen controls over artistic endeavors and lessen tensions with the West. Average Menchani in 1959 “weren’t sure whether they should stay away or give in to their curiosity” and talk to Oswald (p.54). Those whom Oswald met were “mostly courteous and temperate. They listened to whatever he had to say. They were pleasant, if at times a little brusque” (p.55). Thanks to considerable assistance from the KGB, Oswald had a relatively easy life in Minsk, with a comparatively spacious apartment and a prestigious job for the time, as a lathe operator in a factory that manufactured radios and televisions. He found a few friends in Minsk, but most of his co-workers resented his relative privilege. Oswald was too clean, had no real grime under his fingernails, and didn’t like to drink Vodka. Moreover, notwithstanding the loosening of norms in the Khrushchev era, his follow workers were driven by the unspoken fear that “being too close, or perceived as too close to the American would make other people, and especially the security organs, question one’s loyalty” (p.91). Yet, for a fleeting moment in Minsk, Oswald “looked as if he was ready, at long last, to leave behind his adolescence and his many angers and frustrations” (p.106). Oswald developed a deep crush on a woman who turned down his marriage proposal, Ella German, whom he described as a “silky, black haired Jewish beauty” (p.101). Savodnik suggests that Oswald’s decision to leave the Soviet Union and the start of his precipitous final descent that ended in Dallas in November 1963 may be linked to German’s rejection of his marriage offer. A few months thereafter, Oswald married Marina Prusakova after a strikingly short courtship. Oswald’s marriage to Mariana may have been intended to spite German, Savodnik surmises. Marina’s background bore some similarity to that of Oswald: she had never known her father and had moved around constantly as a youth. Marina bore Oswald a child in the Soviet Union, June, born in February 1962; and another, Rachel, born in October 1963 when the couple returned to the United States. Despite good living and working conditions in Minsk by the standards of the era, Oswald gradually discovered, with “unhappiness, dejection and fear” that he was “not a Menchan and never would be” (p.80). Oswald’s experience in Minsk was one of “gradually coming to the conclusion that he was all alone. . . [and] that the Soviet Union was not the home he had hoped it would be” (p.74). Nearly three years after his arrival in Russia, Oswald was “not only angry but also self-pitying, lost, spent, humiliated. In Russia . . . he’d been told, obliquely, that he was not really a worker, a Menchan, that he would never be admitted to the proletarian family that he had disparately craved. His ideology had been sapped . . . and, finally, he’d come to the awful conclusion that there was nothing else to do, so he left” (p.186). In late June 1962, Oswald found himself back in the United States with Marina and their baby daughter. Oswald’s 17 months in the United States after Minsk were “more chaotic, frenzied, hapless, and desperate than any other time he had known,” a period of “continuous unraveling” (p.194). “Unhappiness, fury, a permanent and deepening sense of alienation” were Oswald’s’ “new default position” as he confronted a life of “inescapable rootlessness” (p.189). He and Marina relocated to the Dallas area, but separated shortly after arrival there, with Marina moving in with an acquaintance she had met. During his 17 months back in the United States, Oswald lived at nine different addresses for an average of two months each, plus some shorter stays and trips. He was “unable, as always, to build a life anywhere—to hold onto a job, pay his rent or bills, make friends, or tend to the chores and duties of daily life” (p.190). During this time, Oswald began to cobble together a small arsenal. In April 1963, Oswald attempted to assassinate Major General Edwin Walker, a leading right-wing figure. This attempt had plain ideological overtones: Oswald compared it to killing Hitler. The Walker assassination attempt, Savodnik notes, marked the first time since his suicide attempt in Moscow that Oswald had “sought to resolve his mounting furies with a powerful and culminating violence” (p.196). Oswald took up the issue of Cuba, becoming active in an organization known as Fair Play for Cuba. Oswald then landed a job at the Dallas School Book Depository, from which the fatal shots were fired on November 22, 1963. Ironically, Savodnik notes that Oswald’s position at the School Book Depository provided a modicum of stability to his tormented life. Savodnik considers the assassination a form of suicide, “anticipated many years before by an awful childhood that could not be corrected for by school or social workers and could not be overcome in the Marines or the Soviet Union” (p.217). In “Epilogue: A Conjecture,” Savodnik tries to provide his readers with a sense of what the entwined lives of Oswald and President Kennedy tell us about the United States in the early 1960s. Although he acknowledges at one point that there was an “intense hatred” directed at the President from different directions (p.218), for the most part Savodnik’s description of Kennedy and his administration is so rosy as to be almost unrecognizable. For most Americans in the early 1960s, Savodnik argues, Kennedy “seemed to hover between man and god—to be half man, half deity, and a conduit connecting [Americans] with something eternal and deep. Americans had rarely, if ever, experienced this feeling with their presidents” (p.213). During the short Kennedy administration, a “Rubicon of sorts seemed to have been crossed. Suddenly the affection or sympathy that many Americans had at one time or another felt for a president morphed into a kind of love. . . it was Kennedy, more than any of the thirty four who preceded him, who crossed into the magical realm” (p.213). Kennedy had “captured – he was – the national zeitgeist. The country was confident, bold, unwavering; it knew exactly what it was, and that certainty was central not only to America but to Kennedy’s persona (p.201). In killing Kennedy, Oswald “elevated him—he mythologized a president who was already a myth, and not just him but his title, the presidency” (p.218). This strikes me as over-the-top hyperbole, taking too seriously the Camelot myth that arose after Kennedy’s death and adding little to Savodnik’s narrative. Savodnik admits that Oswald’s “psychology and the interior forces that preyed on him remain a secret” (p.219). But through his treatment of Oswald’s Soviet years and his emphasis on Oswald’s continuous moving and searching, Savodnik succeeds at least partially in explaining what made Oswald tick. Savodnik’s portrait of Minsk during the Khrushchev years, moreover, makes his book worthwhile even for those readers not particularly interested in peering into Lee Harvey Oswald’s tormented mind. If you think there is already a sufficient body of hagiographic work on John F. Kennedy’s brief presidency, this may be the book for you. In “Berlin 1961: Kennedy, Khrushchev and the Most Dangerous Place on Earth,” Frederick Kempe delivers a withering critique of Kennedy’s first year as President — “one of the worst inaugural-year performances of any modern U.S. president” (p.483), Kempe concludes. As his title indicates, Kempe focuses upon Kennedy’s handling of the crisis in Berlin in 1961 and his dealings with his primary adversary, Soviet Premier Nikita Khrushchev. Relying upon recently declassified documents from the United States, Germany, and Russia, Kempe has produced a highly readable account of a time when the Cold War was very hot. Kempe divides his book into short “time-and-place” narratives (e.g., “The Kremlin, Moscow, 10:00 am, Saturday, January 21, 1961,” p.73; “Berlin, Sunday Afternoon, June 4, 1961,” p.253; “The White House, Washington D.C., October 18, 1961,” p.430). He intersperses these narratives with human-interest stories, showing the effects which the super powers’ wrangling over Berlin had upon ordinary people, helping to make his book entertaining as well as informative. Two central events shape Kempe’s chronicle: Kennedy and Khrushchev’s meeting in Vienna in June 1961, and the construction of the Berlin Wall in August of that year. After Kennedy’s razor-thin victory in the 1960 presidential elections, the consensus in the Kremlin was that the newly-elected president was a “lightweight, a product of American privilege who lacked the experience required for leadership” (p.39). Kempe details how the young and inexperienced Kennedy, in an effort to appear tough, rebuffed numerous olive branches thrown his way by his older adversary after his election. Had Kennedy accepted these branches, Kempe suggests, much of the tension relating to Berlin could have been defused. Preceding the Vienna meeting by about 60 days was the Bay of Pigs debacle in April 1961, a CIA-led invasion of Cuba that had been planned during the Eisenhower administration, which Kennedy neither cancelled nor supported fully, and which failed miserably. To Khrushchev, Kennedy’s handling of the Bay of Pigs operation indicated that the young President was not resolute. “[N]ever in his fondest dreams had he anticipated such incompetence. In this first major test, the new U.S. president had lived down to Khrushchev’s lowest expectations,” demonstrating “weakness under fire” (p.177). The meeting in Vienna – what was termed a “summit” — was the first between the two Cold War leaders. Coming off the Bay of Pigs debacle, the young American President entered the “most important week of his presidency as a weary wounded commander in chief who was inadequately prepared and insufficiently fit for what would face him in Vienna. Khrushchev would be scanning for Kennedy’s vulnerabilities after the Bay of Pigs, and there were plenty for the picking” (p.211). The German weekly Die Zeit unkindly compared Kennedy on his way to Vienna to a traveling salesman “whose business had fallen on bad times and who was hoping to improve his prospects by negotiating directly with the competition” (p.197). There was no pre-set agenda for the Vienna meeting, but the future of Berlin dominated the discussions. Although Berlin was deep inside Soviet-controlled East Germany (the German Democratic Republic or GDR), the Allies’ agreement at Yalta in February 1945 had guaranteed Western access into and out of the Western sectors of the city. Khrushchev came to Vienna under great pressure from GDR leader Walter Ulbricht — perhaps the most Stalinist of the Eastern bloc leaders — to stem the tide of skilled workers fleeing East Germany through West Berlin. Too many East Germans were voting against Communism with their feet, exiting the socialist enclave for the decadent West. Khrushchev was very much aware that East Germany and the Soviet Union’s other Eastern European satellites had not reached a “level of moral and material development where competition with the West [was] possible” (p.329). In Vienna, Khrushchev reiterated an earlier threat he had made to conclude a separate treaty with East Germany and leave the West to negotiate directly with Ulbricht’s government on issues involving access roads and air routes to Berlin. Khrushchev let Kennedy know that he preferred to reach an agreement personally with the American President that would alter Berlin’s status. If that were not possible, however, Khrushchev said he would “act alone and end all postwar commitments made by the Soviets” (p.242). No force in the world, the Communist leader indicated, was capable of stopping Moscow from “moving forward on its peace treaty” (p.245). As Kempe notes dryly, Khrushchev was plainly threatening war. Kennedy looked upon Berlin primarily as an inherited inconvenience. During his first year in office, according to Kempe, Kennedy was “not focused on rolling back communism in Europe, but instead was trying to stop its spread to the developing world” (p.486). Although he publicly took a hard line on Western commitments to Berlin, Kennedy’s primary interest was in “preserving West Berlin’s status and access to the city (p.381)” and “avoiding instability and miscalculations that would lead to nuclear war” (p.486). According to recently declassified notes, Kennedy told Khrushchev in the Vienna meeting that “West Europe is vital to our national security and we have supported it in two wars. If we were to leave West Berlin, Europe would be abandoned as well. So when we are talking about West Berlin, we are also talking about West Europe” (p.243). With that pronouncement, Kempe contends, Kennedy went further than any previous American president in differentiating “so clearly between his commitment to all of Berlin and to West Berlin” (p.243, Kempe’s emphasis). In Vienna, Kennedy tacitly let the Soviet leader know that he could do “whatever he wished on the territory he controlled as long as he didn’t touch West Berlin or Allied access to the city” (p.488). 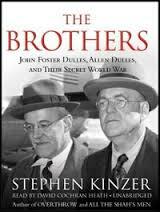 Vienna thus produced a de facto deal which Kennedy was prepared to strike with Khrushchev: “He would give Khrushchev a free hand to seal Berlin’s border in exchange for a guarantee that the Soviets would not disrupt West Berlin’s continued freedom or Allied access to the city” (p.489). failed to challenge the Soviet leader where he was most vulnerable. He had not condemned the Soviet use of force in East Germany and Hungary in 1953 and 1956. Worse, he had not posed the most important question of all: Why were there hundreds of thousands of East German refugees fleeing to a better life in the West (p.233). Kennedy’s Vienna performance confirmed Khrushchev’s growing impression that Kennedy “could be easily outmaneuvered, and from that point forward Khrushchev would act more aggressively in the conviction that there would be little price to pay” (p.259). Kennedy returned to the United States badly weakened after his lackluster performance in Vienna. An aide compared the return trip on Air Force One to “riding with the losing baseball team in the World Series. Nobody said much” (p.258). In what Kempe terms “one of the most candid sessions ever between a reporter and a commander in chief,” Kennedy told the journalist James Reston that Khrushchev had “savaged” him (p.257). Two months later, early in the morning of August 13 of that year, East Germany commenced construction of a barbed wire wall between the Soviet and Western sectors of Berlin, implementing a plan Ulbricht had devised which Kempe compares to Nazi blueprints for building and operating concentration camps. Though Ulbricht’s project was less murderous, “its execution would be no less cynically exacting” (p.325). Under the 1945 four-power agreements, the American, Soviet, British and French military governments of Germany had agreed that they would ensure unrestricted access throughout Berlin, a point reconfirmed in 1948 by another four-power agreement that ended the Berlin blockade. Thus, when the wall went up, Kennedy would have had “every right to order his military to knock down the barriers put up that morning by East German units that had no right to operate in Berlin” (p.359). Khruschev is losing East Germany. He cannot let that happen. If East Germany goes, so will Poland and all of Eastern Europe. He will have to do something to stop the flow of refugees. Perhaps a wall. And we won’t be able to prevent it. 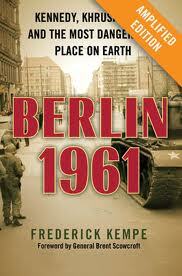 I can hold the Alliance together to defend West Berlin, but I cannot act to keep East Berlin open (p.293). Then, when the wall went up, Kennedy “could not publicly express his genuine relief that the communists had closed the border, but at the same time he didn’t want to express false outrage too loudly” (p.383-84). Kempe pinpoints two “aftershocks” to Kennedy’s mishandling of Berlin in 1961: the long-term “freezing in place of the Cold War division of Europe for more than three decades;” and the more immediate Cuban Missile Crisis in late 1962, with its threat of nuclear war. “The Wall’s construction not only stopped East Germany’s unraveling at a time when the country’s viability was in doubt,” Kempe writes. It also “condemned another generation of tens of millions of East Europeans to authoritarian, Soviet-style rule with its limits on individual and national freedom” (p.485). For 28 additional years, the Berlin Wall “would remain the iconic image of what unfree systems can impose when free leaders fail to resist” (p.502). As to the Cuban missile crisis the following year, although history would celebrate Kennedy’s management of that crisis, “Khrushchev would not have risked putting nuclear weapons in Cuba at all if he had not concluded from Berlin in 1961 that Kennedy was weak and indecisive” (p.485).